Immaculate service? Stunning interiors? A full range of plush amenities? 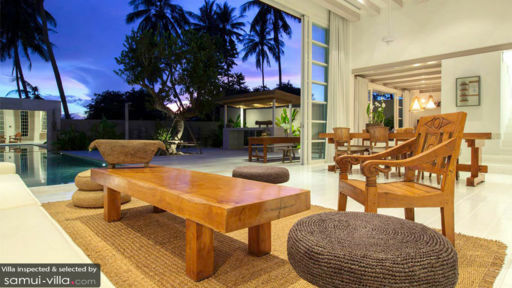 Villa Akasha certainly sets the bar high for luxury vacation rentals in Samui. This three bedroom property, ideally set up for small travelling groups also enjoys a tranquil ambience and close proximity to the beach and local attractions. All three bedrooms at Villa Akasha share similarities, providing guests with air conditioned comfort, private en suites and capacious interiors. What sets the rooms apart are its unique décor and ornaments - from woven rugs, to hanging lamps and colourful art works. The en suites deserve special mention for its gorgeous design and ultra-luxe facilities, such as a decorative shower recess and indoor-outdoor bathtub. With its beautifully landscaped compound and a full range of ultra-luxe amenities, lounging outdoors at Villa Akasha is an incredible experience you won’t soon forget. Sinking into the 14-metre pool is a great way to start your day. Let your gaze rest on swaying palms dotted around the compound as you relax against the sofas in the outdoor lounge. A sala, kitted out with a dining set offers an enviable poolside setting for al fresco meals. Cool, breezy evenings are ideal for barbecue feasts, and that’s when the BBQ deck comes in handy. Bright, airy and contemporary are words that vacationers would use to describe the living spaces at Villa Akasha. Lofty ceilings create a sense of spaciousness within, and this is enhanced when the bi-folding doors are pulled back for indoor-outdoor living. Decorated with a tasteful eye, the common area features an open layout, white and off-white colour scheme and furnishings and ornaments crafted out of natural materials. Both the lounge and dining areas are ideal for private relaxation and social gatherings, and the well-appointed open kitchen (complete with breakfast bar) is fully equipped for your culinary needs. Villa Akasha is a full service villa. In addition to having a villa manager offers 24/7 assistance for all your holiday needs, guests will also enjoy daily breakfasts and housekeeping. A baby cot is available at no additional cost, while babysitting and laundry services are available upon request. In-house dining, massage and yoga sessions are available at additional cost. 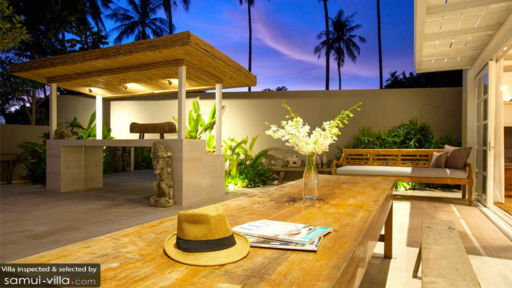 Villa Akasha is located in Choeng Mon, a coastal town set in the northern region of Samui. The vibes here are quiet and laidback, and the area is known for its white sand bays with shallow, child-friendly waters. Choeng Mon Beach, situated seven minutes’ drive from your villa is a favourite hangout for families and expatriates. For a more energetic, bustling beach scene, head further south to Chaweng Beach. It’s 17 minutes’ drive away, and full of action, seafront dining establishments, beach bars and trendy clubs. Step away from the beach to Choeng Mon Night Market. It’s set up every Wednesday evening, and is a great way to discover the local shopping and street food scene. A more subdued and relaxed ambience, coupled with high-end restaurants and shops can be found at Fisherman’s Village in Bophut (14 minutes’ drive). Check out Absolute Sanctuary (three minutes’ drive) or The Yogarden Samui (10 minutes’ drive) for group yoga sessions, and Six Senses Samui (seven minutes’ drive) for an unforgettable luxury spa experience.